Yesterday, China vowed to fulfill its duties as part of the United Nations' latest effort to curb North Korea's nuclear intentions… but we're not convinced. The U.S.-sponsored Resolution 2371, which passed with unanimous support from all 15 UN council members on Saturday (Aug. 5), was drafted with the purpose of hitting Kim Jong Un's regime where it will hurt the most: trade. Specifically, the latest batch of North Korea sanctions will bar North Korean exports of several key commodities – including lead, lead ore, iron, iron ore, coal, and seafood. These restrictions, in turn, will deny the country an estimated $1 billion in exports annually – equivalent to about one-third of its total trade with the outside world per year. 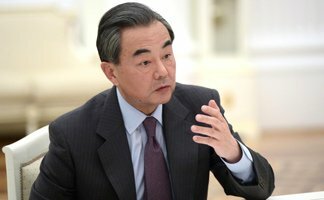 To this point, Chinese Foreign Minister Wang Yi made sure to point out yesterday that, with these latest sanctions, Beijing stands to lose more economically than all other parties involved. "Owing to China's traditional economic ties with North Korea, it will mainly be China paying the price for implementing the resolution," Wang said Monday, according to Reuters. All of China's statements about sanctions on North Korea – its hardship claims, its promises – should be taken with a grain of salt. Yes, China may stand to lose more than other UN countries with the latest batch of restrictions in place. But that's primarily because Beijing has chosen to support Pyongyang by trading some $2.6 billion worth of goods with it this year alone (CNBC, July 12). And then there's Beijing's promise to fulfill its sanctions duties. That's a ruse if we've ever heard one. Because it only takes one look into the recent past to conclude that the Red Dragon doesn't intend to follow through on its sanctions promises. China has failed to implement a half-dozen previous U.N. resolutions since 2006. That's the year when North Korea became the first and only country this century to conduct a nuclear test explosion. While China did reduce aid to the country and increased the price of its oil exports to North Korea that year, it seemed to commit the minimum possible effort for maximum praise. As Globalpolicy.org pointed out in 2006: "Widely hailed as signs of Chinese determination to stamp out the North Korean nuclear program, these measures, however, seem to have been carefully calculated to 'inflict inconveniences.'" Three years later, in 2009, Pyongyang managed to test another nuclear device – to which the UN responded again by imposing similar sanctions. But when the council followed up on the implementation of these restrictions in 2010, it found that Beijing had been notably "lax about applying sanctions against both North Korea and Iran although [analysts said China had] become more vigilant recently," Reuters reported in June of that year. Evidence suggests that even after all of these sanctions, China was still supplying weapons to North Korea. In 2012, Pyongyang displayed in a military parade a long-range mobile missile launcher (called the "TEL") that looked exactly like a model built by a company in Beijing. The Chinese and North Korean versions of the TEL had "the same windscreen design, the same four windscreen wiper configuration, the same door and handle design, a very similar grill area, almost the same front bumper lighting configuration, and the same design for the cabin steps," reported IHS Jane's Defense Weekly on April 16, 2012. This revelation made U.S. defense analysts suspicious that Chinese companies were smuggling arms to North Korea. Their suspicions were confirmed in June of that year, when the UK's Telegraph received classified information that proved Chinese companies had indeed been doing just that. Worse yet, the Chinese government knew about the smuggling. Telegraph's top-secret intel revealed that Chinese authorities had been aware but failed to act when confronted with evidence that Chinese companies were actively supplying North Korea with the materials necessary for weapon creation. This is where the United States, under former President Barack Obama's administration, could have stepped up restrictions again – but this time on China. In February 2013, North Korea tested yet another nuclear device. Again, more UN sanctions. And again, China didn't follow through while technology made within its own borders popped up around North Korea. Obviously, something wasn't working – and still isn't. Anthony Ruggiero, a former Treasury Department official and sanctions expert, told The Associated Press just today that the United States should consider further punishing Chinese banks and companies for helping North Korea evade sanctions. This restriction was implemented on a smaller scale in June, when U.S. President Donald Trump's administration targeted one Chinese bank and company as well as two individuals for sanctions. But Ruggiero thinks broader restrictive measures should be placed on China now to force its hand in curbing North Korea's increasing threats. "Beijing's efforts to position itself as the 'global adult' during the Trump era will ultimately be exposed as a sham – because it's backing the unbackable in North Korea," Bill wrote. He went on to explain that the United States could cut off China's access to raw materials, shut down its exports, and halt its purchasing of American farmlands in order to force the country's hand into pressuring North Korea. The THAAD and GMD defense systems, specifically – they're stationed strategically all over the world for our protection. And both of these U.S. military defense systems were built by companies Bill has helped his readers invest in and profit from. Bill first recommended Boeing back in 2011, when the aerospace manufacturer was worth $61.92 a share. After surging 14% following its recent pullback in May, The Street named the jet pioneer the "Best-Performing Dow Stock" of 2017 on July 25. That's when Boeing hit a high of $211.25 a share. The company has since beat that high. Today, Boeing is $239.88 per share. For investors who followed Bill's lead six years ago, that's a 287% increase in profit. Bill is one of the best stock-pickers alive today. One of his recent tech picks, for example, has earned Private Briefing subscribers 28% since he last recommended it in January. Meet the American-Made "Chinese Carrier Killer"
Do not under estimate China. Ever wondered what happened to General MacArthur? It took the public years to learn what happened with JFK and the Cuban missile crises caused by US nuclear missiles pointed toward USSR from Turkey. With the general he was fired for disobeying orders. The Chinese warned the US to not threaten its borders; which MacArthur promptly did by incursion to the north with USMC within sight of the Chinese border. I met the grand daughter of the general that ordered the Chinese offensive. Do not under estimate the Chinese. Interesting comments from Money Morni h Newsletter.